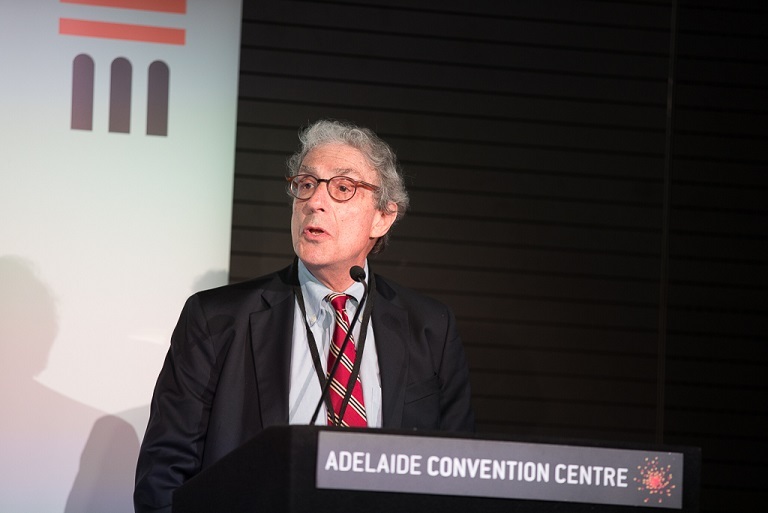 A focal point of the recent National Access to Justice and Pro Bono Conference was the keynote address delivered by Professor Sheldon Krantz on the topic ‘The Legal Profession: What is Wrong and How to Fix It’. This is the title of Professor Krantz’s book, published in 2013. As Senior Fellow at the Georgetown Center for the Study of the Legal Profession in Washington, D.C., Professor Krantz is uniquely placed to describe access to justice issues in Washington and the US. He noted that Washington, D.C. boasts around 80,000 lawyers — more than all the lawyers in Australia! Nevertheless, around 21 percent of the city’s residents can neither afford a lawyer nor qualify for legal aid. Also, over 95 percent of individuals in the District’s Landlord-Tenant Court, in paternity and child support cases in Family Court, and in small estate matters in the Superior Court Probate Division, appear without counsel. “[T]ake a far more aggressive role in pushing for substantially increased public and private support for legal services programs and for fellowships, student loan repayment programs, and other programs to allow more lawyers to pursue public interest careers.” He noted that the Salvos Legal model in Australia, for example, is a model worth emulating. “[O]ffer greatly reduced fee and limited scope arrangements to those who are not impoverished but have limited means.” He provided the example of the DC Affordable Law Firm, which provides low-bono services to low income DC residents who do not qualify for free legal aid. The firm (of which Professor Krantz is a founder) offers consultation, unbundled and full representation for family law, housing and immigration-related legal services. Fees are capped at US$75 per hour with a range of payment plans and business has been brisk. The staff include six law graduates who each provide 15 months of service. “Our legal profession must greatly expand its pro bono commitment. I am in favor of establishing mandatory pro bono requirements but recognise … that this is a very controversial measure that is unlikely to happen.” In the US, mandatory pro bono would provide 66 million hours of service. “We need to eliminate unauthorised practice of law restrictions that preclude non-lawyers from helping to address the justice gap.” In New York, Navigator Programs train college students, law students and social workers to provide information and help to elderly and low income residents to “navigate” their way through consumer debt and Landlord-Tenant court. Medical-legal partnerships are another model to be further developed. “The legal profession must lend its major support to the self-help movement,” by further developing online and other forms of self-help. “We need to continue to simplify court rules and procedures to create a fairer environment for [self-represented] litigants.” Rules and procedures were developed on the assumption they would be used by lawyers, but that is not the case in many areas of law. Law schools should focus more on research and development on “how the legal profession can improve its services to clients and the public,” and on educating the public about their legal rights. One initiative tasked with these objectives is the Justice Lab at Georgetown University, which promotes the role of digital and other technologies to support legal aid agencies and promote self-help resources to unrepresented people. Other US initiatives involve students designing access to justice apps, and students doing fieldwork to assess the need for such apps. As Professor Krantz concluded, given the commonality of needs in Australia and the US, there is ample scope to join forces, share ideas, and work together to find ways to address them. A number of law schools present at the conference took the opportunity to make contact with Professor Krantz. We thank DLA Piper for their sponsorship which helped make it possible for Professor Krantz to attend and speak at the conference. His full address will be available on the Centre’s website soon.